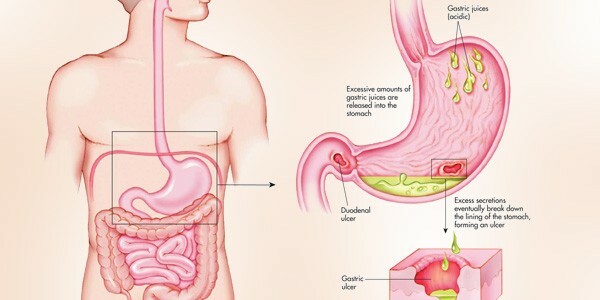 Stomach ulcer is caused when the walls of the stomach are damaged due to excessive production of acidic digestive juices. Individuals suffering from this condition experience multiple symptoms including abdominal pain, vomiting, indigestion, loss of appetite, and gradual weight loss. Although this damage is irreversible, the pain and associated discomfort can be alleviated through proper medication, a special diet and certain precautions. The following discussion explains special stomach ulcer diet and precautions. It is very important for ulcer patients to take all meals on time and avoid snacking at odd times of the day between meals. Stomach acid is produced in response to food in order to digest it. Eating on time tunes the body into releasing the right amount of digestive juice at the right time. On the other hand, eating at odd times, such as between the meals, leads to overproduction of stomach acid. Therefore, ulcer patients are advised to take care of their meal timings and avoid cravings. Caffeine is a popular stimulant found in a wide variety of food items. The highest content of the compound is found in tea, coffee and chocolate. The patients of ulcer are advised to avoid taking caffeine since it aggravates pain in case of stomach ulcer. Excessive intake of this compound also causes acid reflux and heartburn both of which are painful symptoms associated with the disease. Therefore, in order to prevent this extreme discomfort, ulcer patients should cut down their intake of food items and beverages which contain caffeine. At the onset of the disease, caffeine intake should be completely avoided for a couple of months. As the condition improves through medication, patients may enjoy a cup of coffee or tea in a day or small amounts of other food items containing caffeine. Individuals suffering from stomach ulcer should completely give up alcohol. It stimulates the production of acid in the stomach, thereby causing more damage to the stomach walls and increasing the associated pain. Alcohol may not cause any discomfort right away. However, patients mostly notice the effect around a day after the intake of alcohol. Therefore, it can lead to long term damage unless ulcer patients completely give up their intake of alcoholic beverages. Although spicy food may not cause ulcers, it does aggravate the pain. Strong spices, such as red chilies, curry powder, mustard and black pepper should therefore be avoided. Hot, spicy meals can lead to acid reflux and indigestion which can be very painful for the sufferers of stomach ulcer. The condition can become worse despite on-going treatment and medications. Therefore, it is advised to reduce the content of strong spices during the preparation of meals for the victims of this disease. The intake of sodium chloride – table salt – poses health risk in several ways. It has also been proved to be bad for the victims of stomach ulcer. A number of studies have been conducted with the conclusion that a high salt intake worsens the condition. Therefore, along with a reduced intake of strong spices, ulcer patients are also advised to avoid a high intake of salt. The process of chewing food is known as mastication in scientific language. This process stimulates the production of gastric juices for the digestion of food as it passes down the alimentary canal. Chewing gum produces the same effect by leading to the production of stomach acid. However, since there is no food to digest, the acid damages the walls of the stomach. Therefore, the act of chewing gum can lead to the formation of ulcers and make the already existing condition worse. The patients of ulcer must avoid chewing gum, especially on an empty stomach when there is no food at all for digestion. It is very important to maintain the overall health of the digestive system in order to avoid further complications in the case of stomach ulcer. Food items which stimulate the overproduction of digestive juice should be avoided. At the top of the list are fatty foods. In addition, food with a high content of simple sugars should also be avoided. Therefore, ulcer patients have to give up their love for junk food. Stay away from fried snacks, sugary delights fatty meals at all costs. Stress may not be a cause of the disease, but it has been linked to increased discomfort and pain. Individuals who face mental stress and excessive physical exertion in their daily life experience a slower healing time. Due to this reason, ulcer patients must find a way for reducing their level of stress. Practicing yoga, indulging in a good book or spending quality time with family are just a few of the ways through which one can alleviate mental stress and get a break from the hectic day-to-day routine. It has long been believed that milk helps in healing ulcer since it alleviates the associated pain. However, milk soothes the pain only for the time being as it coats the lining of the digestive tract. Actually, it leads to more damage and pain since it stimulates the secretion of digestive juices. Ulcer patients should not, therefore, turn to a glass of milk to relieve their pain. A specific stomach ulcer diet and precautions can help patients fight the pain and discomfort effectively. Have a look at the following discussion in order to know about the right foods which can help in healing and alleviating painful symptoms of stomach ulcer. Salmon, sardines, cod liver oil and several other types of fish offer a high content of omega-3 fatty acids which are a healthy type of fats. The intake of omega-3 leads to the formation of a special compound in the body which helps in the protection of the digestive tract’s lining. In this way, the walls of the stomach and intestine are protected against the harmful effect of acidic digestive fluids. Antioxidants like vitamin C and beta carotene also help in the protection of the lining of the stomach and intestine. Foods high in these antioxidants include carrots, cabbage, apples and kiwi fruit. However, avoid citrus fruits despite their high vitamin C content since they are high in acid which can cause more pain and discomfort. Vitamin E promotes the healing of the damaged lining of the digestive tract and helps in treating stomach ulcer. Food substances with a high content of vitamin E include avocado, hazelnut, sunflower seed oil and wheat germ. An intake of high fiber diet promotes the formation of mucin. The layer of mucin protects the walls of the digestive tract against acid damage. Therefore, eating fruits, vegetables and whole-meal bread and cereals will help heal stomach ulcers. Turn to a healthy source of protein, such as tofu, legumes, beans and poultry with the layers of fat and skin removed. Protein will help in maintaining the overall health of ulcer patients who have to eliminate quite a large number of food items from their diet plan. Substitute unhealthy ingredients with low-fat and low-sugar alternatives, such as non-fat mayonnaise, honey and low-fat salad dressings. Knowing what to eat and what to avoid can greatly improve the health condition of ulcer patients. Skipping harmful food substances and turning to healthy choices can promote healing and prevent further damage to the walls of the stomach. In addition, observing the above mentioned precautions can help individuals alleviate the pain and discomfort associated with this disease in order to be able to lead a normal life.